Going into this MLG, the first Dota 2 MLG, I didn’t really know what to expect. Never having been to Columbus before, that added to the mystique. In the end, I came out of it with a truly unforgettable experience, friendships, and a new-found understanding for why so many pro players are so damn skinny. I apologize in advance for the relative lack of pictures, as it’s a personal thing for me to not abuse my access when I’m invited to an event. This is my point of view from MLG Columbus 2013 as both an invitee to help with DK, and as a Dota 2 fan there for the spectacle, and finally, as a DK fan. I left home in Seattle at 5am sharp to catch a series of flights that would guarantee I arrive in Columbus with a few hours to spare before DK’s plane was scheduled to arrive, the reason being that my first duties for MLG Columbus entailed being at the airport with the hired van driver to pick up DK and get them to the hotel. MLG had rented a big comfy van and a driver for this purpose, and around 9pm I got the call from the driver downstairs of the hotel and we headed over to the airport. Whilst waiting, Sigma and NaVi both went by and Dendi noticed me, got a goofy grin on his face and waved, to which I grinned back and waved probably even more goofily. His team seemed to be like “what you doing bro” and he gestured in my general direction. A brief time later, and the first of DK appeared at the foot of the escalators, coming down from the upper level of the airport to the baggage claim area. iceiceice, Mushi, and MMY, then BurNIng and LaNm. BurNIng smiled, somewhat surprised I was there I suppose, but seemed happy enough. A familiar face after nearly a full day of travel, perhaps? I waved as they approached, greetings were made, and iceiceice asked some random questions. We waited for their checked bags, and then we were off to the van to the hotel. On the way to the hotel, I asked if they were hungry, and hungry they were. After getting them into their rooms and dropping their stuff off, by this time it was nearly 11pm, and so we simply decided on getting them food at the bar on the second floor of the Hilton. They got some pizza and wings, and LaNm wanted a burger, so he got that too. Iceiceice got a single pork belly slider — it was good, he said. While eating, MLG’s Adam happened upon us, and the introductions were made. Awesome guy, super straightforward kinda dude, he made sure that DK were as comfortable as they could be with their accommodations and filled me in on the basics of what to expect for the weekend. With stomachs filled, the team was ready to rest up. LaNm would room with BurNIng, and BurNIng jokingly asks LaNm if he snores. LaNm exclaims that, no, he doesn’t! Mushi and iceiceice are together, while MMY rooms with the manager Farseer. I update them on the schedule for the next day: venue opens at 10am, teams are free to enter at that time to practice on the many stations MLG had set up backstage, the event officially starts at 5pm, etc. MLG really had their bases covered regarding practice space for the teams — there was never a lack of stations for teams to warm up and watch replays on and players had full access to these stations during all hours of the event — well played. Friday started off slowly as only half of DK had gotten up by the time I got down to the venue around 11am. The ones that had gotten down there, however, apparently had woken up at 6am — even after that late night and all the travel. I found LaNm, iceiceice, and BurNIng I think it was at the off-stage area. We were soon joined by Mushi and MMY, and the five of them had some fun playing a few pubs together. At lunchtime, we ventured over to the nearby North Market, where everyone got pho except iceiceice, who got Indian food. LaNm however became distracted by a Thai place and promised that he’d come get that next time… though there wasn’t another opportunity for him to do so over the weekend. As noon passed, they wanted to head back up to their rooms to rest a bit more, as most of them had woken up early due to jet lag and needed some more sleep. Unfortunately this meant that they missed their 4pm autograph session, but hopefully DK were generally available enough over the next few days for any fans to meet and greet with them. Around 5pm they came back down, bleary-eyed but with a bit more bounce in their step, and went back-stage to warm up prior to their on-stage matches against Alliance and Liquid. First they played a pub or two together, then did some analysis and discussion to their upcoming games. Team DK backstage at MLG Columbus. 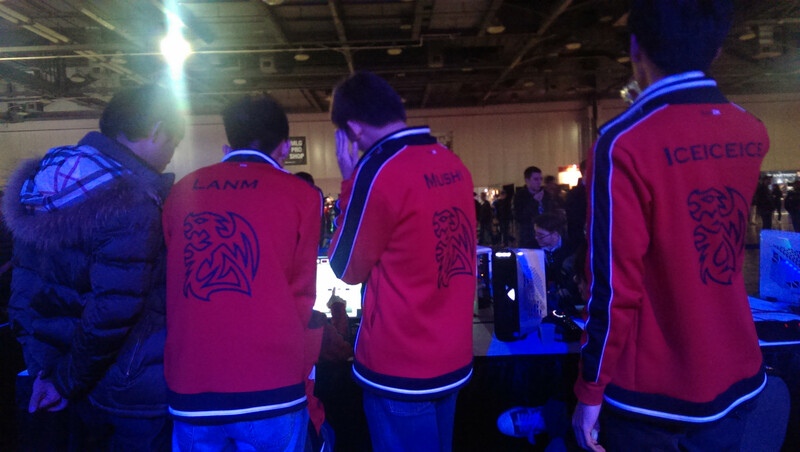 And then they were up on stage to play — Alliance, followed by Liquid. Honestly I hardly even remember these games themselves, but DK came out of the games 2-0 victors, showing impressive form. After the games, some passionate local Chinese fans (students from surrounding universities, mostly) came and offered to take us all out to eat. The offer seemed to be well-received by the Chinese contingent of DK, while iceiceice and Mushi apparently had been planning on going to get a burger nearby. Either way, everyone ended up piling onto a couple cars and off we went, about ten minutes away, to a Chinese restaurant. DK’s next match would be their first off-stage match, against Fnatic. I had them down at the venue by around 10:30am so they could have some time to warm up and get used to the setting, and they had some fun playing more pubs together. They started their last pub pretty late before the 11:30am start time against Fnatic, with just around 20 minutes time. LaNm declared, “Pick fast push!” and off they went, with the likes of Shadow Shaman, Leshrac… for an 11 minute victory. The rest of the day, DK mostly cruised. Right before the DK and Navi went on stage, they were informed of the question that would be asked of each of them. Iceiceice and Puppey quickly decided that they would coordinate an answer between themselves, and hence came the hot chocolate answer. 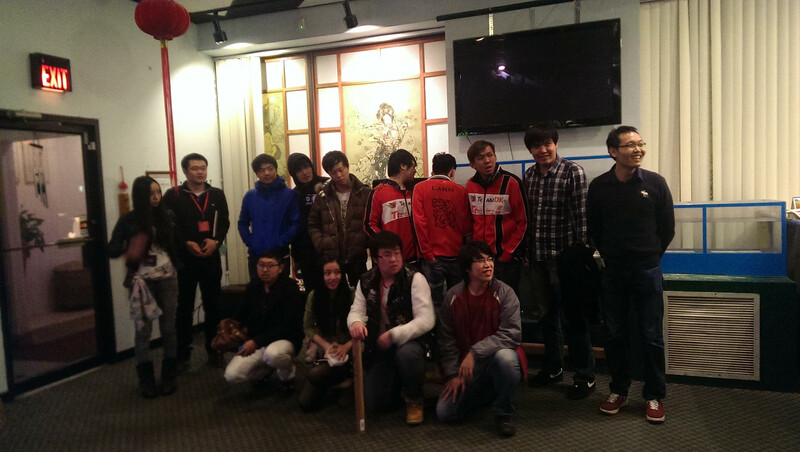 After their off-stage match against Sigma, they had around 2 hours for dinner or a break, or whatever. 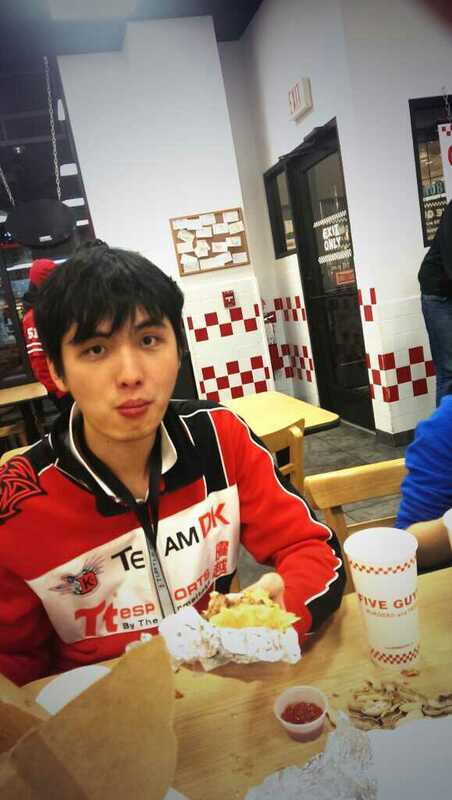 All of them except iceiceice chose to head up to their rooms to get some sleep, while iceiceice went with us to Five Guys at my suggestion, as he had been wanting a burger. It was snowing again as we made our way by car to the Five Guys a mile away, near Ohio State University campus. I ordered for iceiceice at his request, and got him a bacon cheeseburger with everything, plus extra mushrooms and onions, with A-1 sauce on top. “This is quite good,” he said through big mouthfuls. I’m glad you liked it. The light snow continued on our way back to the hotel. “Snow makes everything look nicer,” iceiceice remarked. Yeah, it does. But it was still cold, and iceiceice quickly forgot about his plans to make frosty clouds of air with his breath outside as we rushed back inside the hotel from the car. For the remaining hour, he went up to his room to relax for a bit as well, and so I waited downstairs for the rest of the players to appear at 8pm, half an hour before their scheduled match against Pretty Boy Swag. Mushi came down first, followed by MMY, but then the rest of them were nowhere to be seen. 8:15 went by, then 8:20, then 8:25. By then I’d knocked on their doors and had begun calling their rooms. Sleepy voices echoed out from the other end of the phone, at least alleviating my fears that they’d somehow gone out and gotten lost somewhere. Instead in its place was a mystifying wait, as it was only 15 minutes later that iceiceice finally appeared downstairs, by which time it was already 8:40. So I went to room 520, where BurNIng and LaNm were staying, and knocked on their door — LaNm came to the door, putting on his jacket, and BurNIng was just climbing out of bed. He looked groggily to me, “We’re late, aren’t we?” I looked back at him… “Yeah, yeah you’re late,” with an exasperated but amused feeling inside. BurNIng gets up, puts his shoes on, and looks at his phone and bursts out laughing. “I know why we never woke up!” he looks around at LaNm and me, “It’s because I set the alarm for 8 in the morning, when it should’ve been for night.” I laughed, LaNm laughed… Yeah, that’ll do it… that’ll make you late indeed. We rushed down to the venue, a mere 25 minutes late for Pretty Boy Swag. DK was clearly still tired, as their play and drafts were sloppy in both games against PBS and later Speed. DK drafting in an off-stage match. Afterwards, we discussed with MLG briefly the logistics of the next day’s semifinals matches, upon which DK eventually decided on playing second, and they went back up to work together on discussing their next challenge against NaVi. BurNIng started discussions that night by saying to his team, “This is one of our great opportunities to win a title… we’ve come so far already…” Even though they were fine with me being there, I didn’t want to intrude any further, and after helping them get a late dinner, I said my goodnights, made sure they knew their schedule for the next day, and left them to their preparations. The next morning, iceiceice, BurNIng, and LaNm were up bright and early as I found them around 9:30am finishing up breakfast at the restaurant on the second floor. After breakfast, BurNIng went back up to get some more sleep, and iceiceice, LaNm and I headed to the venue. We went backstage, and LaNm excitedly exclaimed, “Time to pub! !” I love playing pubs!” and then invited me to play with the two of them. That was pretty fun. During one of the pub games, the other team was convinced they were fakes, but by the end, were wishing DK luck at MLG. 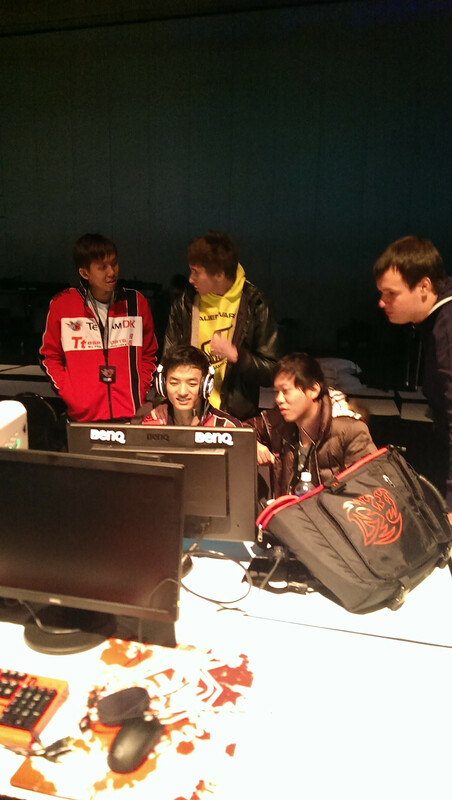 A bit later, MMY, BurNIng, and Mushi showed up, and DK gathered to do some last minute analysis and whatnot. DK preparing before MLG semifinals against NaVi. With about an hour to go before their semifinals match against NaVi, NaVi themselves showed up, and the two teams hung out a bit backstage. Iceiceice challenged Kuroky to an arm-wrestling match, and upon beginning the match, iceiceice immediately took both hands to KKY’s one hand, ‘won’ the match illegitimately, and raised his arms in triumph while Kuroky looked on with a mixture of bemusement and non-acceptance of having just lost the arm wrestling match. The rest of the time went similarly lightheartedly, with chattering and trolling and joking amongst the two teams. I think it was before the NaVi match here that Mushi ended up being the one who had an on-stage question directed at him, thanks to iceiceice volunteering him for it while Mushi was in the bathroom. Mushi came back, heard that he was going to be questioned, and immediately shrank back trying to decline. In the end, I coached him on his answer a little bit after Mushi kicked iceiceice for signing him up in absentia, and Mushi went on-stage with his answers ready. Then came the semifinals match. The actual games were a blur in my mind, but DK ended up with the win after a game 3 in which BurNIng, perhaps uncharacteristically, took the risk of building a Divine Rapier when he wasn’t absolutely pressed to do so (in fact, not at all needed). Throughout the weekend, DK were regularly mobbed by fans looking to get pictures and autographs, perhaps because DK were unable to make their session. Hopefully they were available enough throughout the event to make up for their absence at the session. On finals day, they had far less time to pause for signings and photos, and even still, they tried their best and often I had to play the bad guy to ‘drag’ them out of a crowd of fans in order to keep them on schedule. Hopefully no one was let down, and hopefully everyone understands the scheduling… BurNIng always had a conflicted look on his face whenever he had to decline. And then, without much downtime at all due to scheduling delays, DK were up to play against Speed.int in the Finals of MLG Columbus. They’d come so far, and perhaps this was the closest any of them had been to a title in recent times. It was Mushi’s first final ever, in fact. DK won game one after a gruelling back and forth battle, with LaNm carrying the team on his spectacular Earthshaker play. After that game, backstage, LaNm was exhausted. He looked like he’d run a marathon, and indeed, he probably did the mental equivalent. By this time, DK hadn’t eaten since breakfast around 10am. A lot of players prefer not to eat full meals within a reasonable time of a competitive game, so you can imagine just why guys like LaNm are so skinny. One more win, one step away. In the end, DK faltered. LaNm was practically asleep during the game 2 draft, and from a casual fan’s point of view (my point of view, that is), his seating in the center of DK’s five isn’t a coincidence. He’s the beat of the team, the rhythm-keeper, and when he’s tired, the team feels it. (For those that are curious about DK playing the second semifinals, refer to this reddit post to learn more) Some of the drafts were questionable too, perhaps another result of the team, and BurNIng, being really tired. After the loss, Mushi sat quietly for a bit, the rest went without talking, and then they waited for each other to head back to the hotel together. It was nearly midnight already, and MMY, BurNIng, and LaNm all went up pretty quickly and fell asleep. Mushi came back down after a while, he and iceiceice hung out with us on the second floor lobby. We ordered some pizza and pasta delivered and the two of them, with me and my girlfriend, we four sat peacefully, eating and chatting into the night until about 2:30am. BurNIng, MMY, and LaNm were to leave at 6am in the morning for their flight back to China and I was to go with them to make sure everything went smoothly. 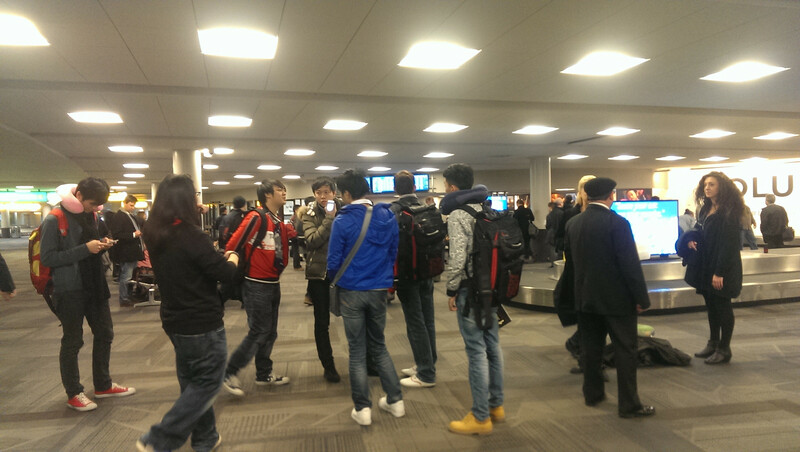 Originally iceiceice and Mushi were supposed to come along too, but their flight being only at 11am, they decided to head to the airport later. At nearly 3am, we all headed back up to our respective rooms, said our goodbyes. A few minutes later, iceiceice messages on Wechat (instant messaging service) asking what room I’m in… and appears at the door in his boxers. He insists on giving me the stuff from the bag that MLG gave to each player — a Steelseries mouse and mousepad, and a Turtle Beach headset. So right now I have in my possession the headset that iceiceice used live in his off-stage games at MLG. o_O. Thanks ice. Then we say what we think are our last farewells for the weekend… Hotel fire alarm goes off ten minutes later, and we see iceiceice and Mushi again in the lobby. Evidently, the rest of DK has slept through the alarm. Sometime during the night, we ran into Dendi. He offered a photo op with him, but then added on that it would be ten dollars. Instead, I offered him the photo op with myself, he accepted, and thus I got a free photo. And he gave me a hug too. That made me feel better about the finals that had just ended… Thanks Dendi, you’re cool. I’ll see you next time too. In the morning, BurNIng and LaNm are downstairs and checked out on time, and after a slight delay, we have the others who are leaving on the morning flight. Spirits seem to be as high as they can be after losing a major final… or perhaps it just hasn’t sunk in yet. I know it hasn’t for me yet at that point. They’re discussing loudly — boisterously, even, what went right and what went wrong for them the previous night. LaNm is confident in what he says, MMY often offers a different perspective, while BurNIng sometimes agrees, and sometimes disagrees with the both of them. I go with them through security check, and after half an hour in which they never stop discussing, their boarding call is heard, and I herd them over to their boarding gate. MMY smiles wanly before quickly turning away, the manager nods in appreciation, LaNm waves and simply says “See you next time”. BurNIng lingers a little bit, turns to me, smiles, and says “Give me a hug!” And then DK was gone, as quickly as they’d come. Perhaps it didn’t sink in for them until they got back. It didn’t sink in for me until the trip home. I only then realized that I had so wanted to be able to send them home that day with the trophy, with a major tournament title. I’m sure they wanted it way more than I ever could have imagined. All credit to Kaipi/Speed, they played to their style and didn’t let anyone or any external factor (of which there were many — all the more impressive for them) stop them, and that’s what winning is about. As for DK, MLG Columbus weekend has given me an unimaginable chance to be close to them, get to know them, and perhaps even help them. I can only thank MLG and Adam for the opportunity, and my respect and liking for DK and each of their players has only increased, if that was possible at all. DK — BurNIng, LaNm, Mushi, MMY, iceiceice… you guys are great. shout outs to Cyborgmatt, Xixi, LD, Vykromond, Lumi, DPM, Godz, Merlini, Tangeng, Sun-Tzu, Dendi, Valve Chris, Valve Phil and family, and anyone else I missed but enjoyed the company of, for being fun to chat or hang out with at various times during the weekend. You all helped me keep my sanity while I went through with ~14 hours sleep over 4 days. NaVi was interviews by Gamefy in this video, where they talk about their hopes for their trip, iG’s recent form, and more… Make sure you have annotations on if you wanna know what the Chinese voice is saying in between. Be sure to give the original video at Youku a hit too. Q: Hello Dendi, thank you for accepting 178’s interview. This is your first time visiting Kunshan right? What first impressions do you have of this city? Dendi: Hello. To be honest, I don’t yet have much of an impression, because I came here directly after getting off the plane. Q: Then how do you feel about the atmosphere of the event here? Dendi: Very nice, although it feels like there are relatively few people. But Chinese viewers are very passionate. Q: Previously we heard that the Ukrainian team’s travel visas encountered some issues, can you explain what happened? Dendi: Ok, because we were coming directly after playing at Dreamhack, schedules were very cramped, so at the airport when we spoke with the customs officer we were told that our visas had problems. After hearing that, we begged them and asked them in every way, and finally the second day they allowed us to go. Q: Has this mishap affected you guys at all, are you tired at all? Does it affect your form? Dendi: No, not at all. Conversely, we actually got quite a bit of rest time during the day that we spent waiting, we passed it quite luxuriously, so there aren’t any problems. Q: The Ukrainian team this time is pieced together with players from different teams, how do you feel about the team’s ability level? How is your teamwork coming along, did you engage in any special training for WCG? Dendi: These players and I go back quite far, and players like goblin are long-time veterans, lots of experience, so their ability is absolutely solid. The only thing we lack is team understanding, because time has been quite tight so we never had any previous practice. We’ll have to learn as we compete; let’s see if there will be good results. Q: Actually, you have practiced! Just now at the Dota2 expo booth here, weren’t you guys grouped up in a match? Dendi: Haha, that was just for fun. Q: Then tell us about your Void just now… why did you build Arcane boots and two Blades of Attack? Dendi: Playing pubs is just for fun, so I built whatever I felt like building, plus Void does really have mana problems!! Q: In your latest match in WCG, your team easily defeated a Mongolian team, talk a bit about that match. Dendi: It was alright, but the internet at the live event really is horrid. The screen was stuttering back and forth, this really affects our performance. Q: In your group, there are two other powerhouses in Orange and DK, do you think you have a good chance at advancing from the group? Dendi: I can’t really say, we can only try our best, and beat at least one of DK or Orange. Q: At this WCG, which team do you think will take the title? Q: Is this your first time participating in a WCG World Finals? What are your thoughts on Dota2’s first appearance as an official competition? Dendi: I’m very excited, after all WCG is an old-school big name competition. As for Dota2 being added in, I can only say one thing: it’s cool!!! Q: Next up we’re gonna head into gossip hour. Your style and personality has won quite a bit of fame and following, and a lot of Chinese girls like you a lot, did you know this? Q: Well then, do you like China’s girls? Any considerations of finding yourself a Chinese girlfriend? Dendi: It’s possible, Chinese girls are quite nice, for example there are many hotties right here at this venue, haha. Q: Alright, I can only say I wish you good luck then. Thank you Dendi for the interview, we hope you will bring us more exciting play. Unable to play in WCG, ChuaN is hanging out. Here he’s been recruited as an emergency translator as GTV’s Xiaoyou attempts to interview Dendi! I make no judgment of the interviewer. lol. Dendi shows off his limited Chinese skills, all in all good fun. Rough transcript below (actually not that rough). 0:18 Xiaoyou: Here we are fortunate enough to get an interview with NaVi’s Dendi, representing the Ukrainian team in Dota2 at WCG, a player that everyone loves. First off let’s have him say hi to everyone! 0:33 Dendi: Hello, I am Danil Ishutin, I play for NaVi, at this WCG I play for Ukraine. 0:42 Xiaoyou: Oh, I forgot to mention, this here we have ChuaN who is serving as our special translator, give him a shot. Okay, good, thank you to him for the hard work. 0:49 Xiaoyou: *laughs* Really, the two of them have a great relationship, we can all see this. Anyway, we’d like to ask Dendi, how many times have you visited China? 1:02 Xiaoyou: Then can you speak any Chinese? 1:20 Xiaoyou: Now that this is your third time here, can you tell us your impression of China? 1:22 Dendi: Mmm, it’s pretty good. Only been here one day so far this time. 1:34 Xiaoyou: Then… you like China? 1:44 Xiaoyou: *laughs* I really want him to say a bit more! Then let’s ask him his impression of the girls here in China. 1:54 Dendi: China girls are very cute. 2:00 Xiaoyou: Ohh, yes, I see. *embarrassed* When he said that he glanced at me!! Nah, just kidding. 2:04 Xiaoyou: Okay, let’s ask some real questions. You’re here for the Dota2 competition, representing Ukraine. Then, were there any special preparations before coming here to compete? 2:16 Dendi: *ooooh points at ChuaN accusingly (he thought ChuaN mistranslated on purpose to ‘steal’ practice secrets, joke of course)* Well, we have some strategies in mind but we didn’t practice at all. 2:30 Xiaoyou: Ah. So when he pointed at you just now, it was because you are iG and he was accusing you of trying to sabotage them? 2:36 Xiaoyou: Ohh. We can see that Dendi is indeed very smart. Okay then, now I want to ask a bit about iG. At TI2 in Seattle you guys ended up losing to iG to take 2nd place, did you do any extra analysis of iG afterwards? 2:53 Dendi: We tried to realize what went wrong, and so on, yeah. 3:03 Xiaoyou: At this competition, who do you think is your biggest threat? 3:22 Xiaoyou: Indeed. So without ChuaN iG is not threat to them, is that what he means? 3:38 Xiaoyou: Okay, at last, because there are many many fans that really love Dendi, we hope that Dendi can say some words to all those fans of his. 3:51 Xiaoyou: Oh… is that all? I want him to say more, because this competition is an important one, how about he says some stuff to add oil for his own team here? 4:13 Xiaoyou: And we also hope that he will achieve his results, and not let all us fans down! 4:20 Dendi: Yeah, thank you. 4:25 Xiaoyou: Okay then. We hope everyone plays well. This was an on-site report brought to you by GTV. Dotaland note: 17173, organizers of the G-1 League currently ongoing, has this interview with iG.Faith. Good insight into iG and perspectives of things from a top tier pro. In the G-1 League group stages, team iG has shown an enormous display of skill and ability in consecutive wins over MUFC and LGD. On this, we interviewed iG.Faith, and learned more about iG’s latest developments. G-1: Hello Faith, thank you for doing this interview with G-1 Champions League. 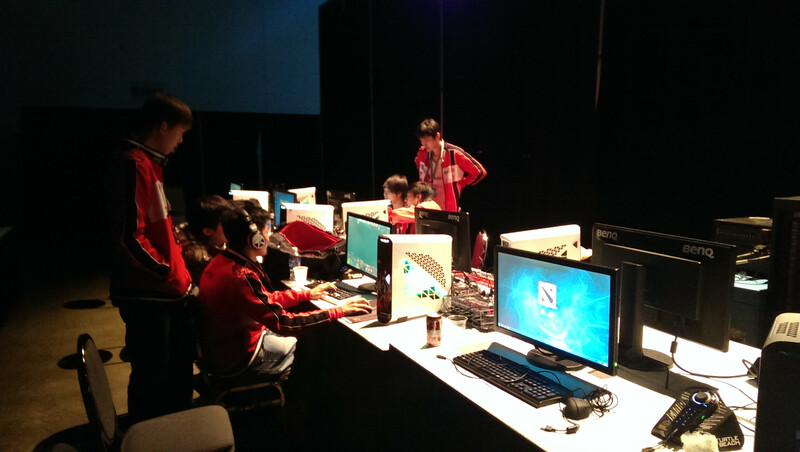 In yesterday’s key match against LGD, your team was able to take the win 2-0, which surprised some people. Can you comment on the match a bit? iG.Faith: Both games revolved around a high pressure in-your-face team ganking strategy led by Bounty Hunter and Night Stalker. Yet in both games, the opponent lacked any kind of crowd control team fight ability, so they ended up losing fights over and over as they tried to defend their towers. G-1: This match received extreme amounts of attention, so with iG being able to take the win so easily, what were your first reactions, and does this give you more confidence for your upcoming matches? iG.Faith: Both games revolved around teamfighting so to pull it off successfully left us feeling very satisfied. Of course we will gain confidence from this, but we also will not underestimate any opponent. G-1: Can you tell us why iG is so strong right now? Has the TI2 title really triggered a chemical reaction within the team? If you had lost in the Finals against NaVi, would your current mentality, confidence, and form be any different? iG.Faith: I think we’re close-knit as a team, trust each other, and we are quite all-around. The TI2 title gives us motivation, as well as pressure to perform. If we had truly lost back then, we would still need to rely on our own ability to adjust ourselves and the team as a whole, because in the end we still believe that we are a talented team. G-1: Can you evaluate the current LGD? It seems like xiao8’s position is shifting towards a support role. In your match with them yesterday, what do you think was different about them compared to in Seattle? iG.Faith: I felt they weren’t as good as they used to be, perhaps because they’re changing roles. In comparison, it’s still LGD of the past that’s a bit stronger, in Seattle every match with them left us feeling drained. G-1: Talk a bit about your thoughts on the new DK and TongFu rosters, or how do you view 357, Dai, longDD, Veronica (new TongFu member)? iG.Faith: DK should need less time to learn to play with each other, after all 357 and Dai are veterans and will have a comparatively easier time blending into a new team. As for Veronica and longDD, what they’ll need to do first is find and confirm their role with their new team. G-1: You guys will soon be participating in the WCG Dota competition, and afterwards there is the SMM Dota competition, so you continue to be busy on two fronts. What are your thoughts on future ACE and G-league competitions then? iG.Faith: If we compete in Dota1 then we will practice Dota1, if we compete in Dota2 then we will practice in Dota2. I think in the future Dota2 will become the mainstream. G-1: Apparently iG’s team headquarters has moved to Shanghai, can you reveal the specific reasoning for this? Compared to Beijing, how is the new environment, what is your favorite aspect, or what do you miss from Beijing? iG.Faith: The main thing is that Shanghai’s internet service is better, so we decided to move to Shanghai. In terms of environment it’s also quite a bit better than Beijing. It’s still got to be the improved internet in Shanghai that satisfies me most though, this way we can practice better, and perform better in online competitions. G-1: LGD has built an international team. If iG were to really create an iG.int, which international players would you recommend to your manager? iG.Faith: This is something I’ve never thought about, we players are only responsible for playing Dota well, win championships; other issues are up to the club’s management to handle. 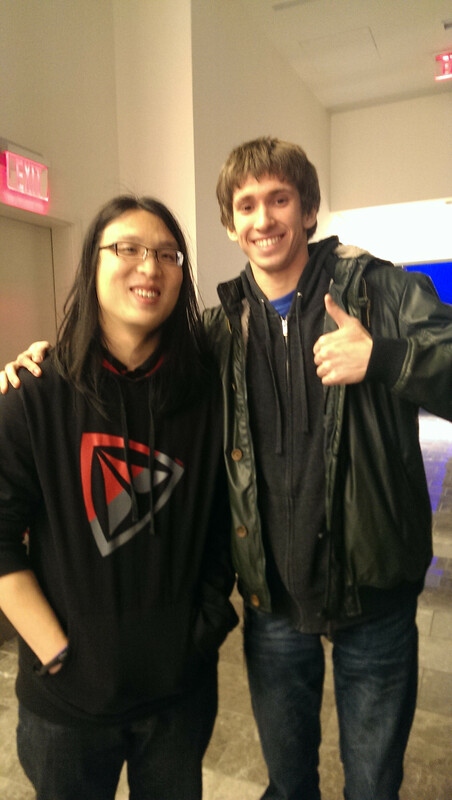 Although in Seattle I gained a strong impression of Dendi, he is very lively and funny. G-1: Apart from this iteration of the G-1 League maintaining its easygoing, fun, style, the actual competition has made big breakthroughs in terms of participants, format, and prize money. Which of these has given you the biggest impression? iG.Faith: This time G-1 will have an offline portion, so in comparison to the past the matches will be even more intense. G-1: There was an interesting sidenote from yesterday’s match with LGD, you guys failed to join the room 10 minutes early and as a result lost 20 seconds from your ban/pick timer, what is your opinion on this relatively strict ruling? If you have any other suggestions for the G-1 League, we will strive to improve. iG.Faith: Don’t really have anything, I feel it’s all pretty good. At the time YYF was watching replays to analyze, and ended up forgetting the time for a while, the resulting punishment I feel isn’t inappropriate. G-1: Thank you Faith for doing this interview with us, is there anything else you’d like to say to everyone? iG.Faith: Thank you to the club for the nurturing you’ve given us, thank you to everyone for your support, in the future we will continue to do our best to bring exciting matches for all. Chinese caster, vod maker, MIK answers some questions. She talks a bit about Dendi, a life of Dota, Dota2 vs Dota1, and more. Replays.net (RN): Hello MIK, very glad that you could do this interview with us. Why don’t you introduce yourself a bit, surely you have many fans who want to get to know more about you. MIK: Hello everyone, I am that lively and cheery Mik, I am also just a normal Dota player, and in the future I will certainly see everyone plenty, so I hope that you all can support me. MIK: I feel that, to me, Dota is very important. I remember there once was a saying, “Lonely women wear stockings, lonely men play Dota”… well what am I if I both wear stockings and play Dota?! Haha, playing Dota has let me meet a lot of friends, such as Xiaojian (caster, vod maker), such as Dendi. I’m sure many people have similar experiences, playing full pre-made games with friends having a lot of fun. In the past playing on VS, I didn’t really care about levels, didn’t really level up to get into higher ranked rooms. Instead we made countless smurf accounts to continuously beat on newbs (speaking of this, suddenly I realize how evil I was). So all along, there have been too many precious memories, and this is why I am so dedicated to Dota. RN: “Let’s be lifelong friends, and play a life of Dota!” – this is MIK’s motto. The girl who says this phrase, by my view, must be someone who has made a lot of friends through Dota, and must have considerable love for the game. So how about MIK you give your own understanding of this phrase for us? MIK: I’m sure this phrase reflects the hearts of many Dota players as well. Dota brings to us not only fun and excitement, or the joy of playing with a full pre-made team of friends; moreso, as a team game, it brings a type of emotion, no matter win or lose many people will have their own little teams that they go through everything with, and this is a process that is irreplaceable. So when I found that more and more players are leaving Dota, it was quite a bitter feeling. This phrase, then, is also a call to all players past and present, hopefully we all stand together with MIK, and continue our Dota beliefs. RN: Yeah, we definitely will continue on. This is our generation’s great mission! I think, then, that MIK’s choice to do casting and vods for Dota2, Dota1’s official successor, reflects your desire for Dota to reach more people. Talk a bit about your thoughts on Dota2, what are some differences from Dota1? MIK: Dota2 is still closed to the public here in China. So my work in doing vods is targeted towards exposing more players to Dota2, and of course the hope is that more people see it and as a result gain more interest in Dota2. At the same time, I also hope to gain some recognition and support from everyone, and this way I can create even more value. RN: Indeed as MIK says, Dota2 is not very widespread right now, yet players have unmistakeable fervor for this legendary status sequel, and Seattle’s International has pushed this even higher. We’d like to know, how does MIK rate Dota2, and what are your thoughts on its future? MIK: The International in Seattle, whenever it’s brought up I’m sure people will think immediately to the million-dollar prize. This time with five Chinese teams making the trip across the Pacific Ocean, it was a very heart-lifting sight to see. From the group stages to the loser and winner brackets, it let us fans thoroughly enjoy ourselves. This time in Seattle has also promoted Dota2 very well, I truly believe that Dota2 will create a huge market for itself in China. Dota2’s graphics and attention to detail are touching, and IceFrog’s has put a lot of dedication into it and has improved the game over and over for players. As a Dota player I’ve personally undergone the transition to Dota2, so my hope is that everyone also continues to patiently wait for Dota2 to go open, it will absolutely not let you all down. Today, we can only hope that all of us stay put and wait, those of you that have left we hope you sometimes come back home to visit. Here, this is real esports! RN: Now you’re doing first person vods for Dota2, and as your contribution to Dota2 promotion, we’re sure that many players will come back home because of you! Tell us your favorite team, and your favorite player. MIK: There isn’t a single favorite, because in my eyes, all players are really the same. Including professional players. I do have a liking for PCT (former EHOME) because he will always play with me, and not avoid me because I’m bad, and often gives me helpful tips, so I’m very thankful to him. Apart from that, NaVi’s Dendi and LightofHeaven, they’re both very friendly and warm, and in the future if there’s a chance I’d like to collaborate with them in putting out some vods. RN: Wow! These are all big players! I’m envious and jealous! Surely with the help of these players, your vods will continue improving. We look forward to the collaboration! RN: For sure! You will not lack for motivation! I remember your last Windrunner vod, MIK you said that this is your favorite hero, can you say why you like her so much? MIK: Haha. When I first played Dota, my friends would all have me play heroes that wouldn’t die easily, such as Windrunner’s Windrun, Morphling’s Wave, Anti-mage’s Blink, and over time, I took a liking to Windrunner, and slowly gained my own understanding of her. When I first came to Dota2, to make the transition easier with a familiar model, I picked Windrunner and played her endlessly. -.- And then afterwards, playing other heroes became much easier, so Windrunner is truly my goddess. RN: So that’s how it is. I really like Windrunner as well, when there’s time you must let me tag along and learn from you. Haha~~~ oh right, then does MIK have a boyfriend? I believe many male fans of yours will want to know the answer to this question, because you are their goddess. And also, can you reveal your ideal boyfriend… I thank you on behalf of all our fans! RN: Alrighty! All you hungry fans, MIK’s requirements can’t be more suitable for you all! Add oil, I will wait for your wedding candy! At the last, MIK can you please say a few words to end our interview today? MIK: Ok. “Let’s be lifelong friends, and play a life of Dota!” My heart is Dota. Add oil!